The beautifully appointed self contained Three bedroom villas feature a Queen master bedroom with ensuite bathroom and two twin rooms each with single beds and a shared second bathroom. All villas have a large kitched which are fitted with a dishwasher, microwave, hob/oven and fridge/freezer as well as a comfortable living area with a dining table, Television and DVD player. 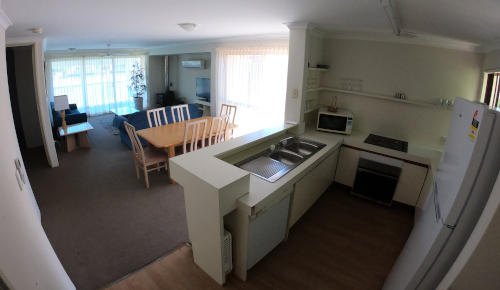 Additional guests can be accomodated on a pull out sofa bed facility in this area (fee's apply). Each villa has an outdoor table on the verandah overlooking our beautiful lake. There is a coin operated laundry on site. All villas are strictly non smoking but is permitted outside.